Shari and Hutch live on the road full-time in their vintage “canned ham” trailer. Every Thursday, they’re bringing us stories from the road. 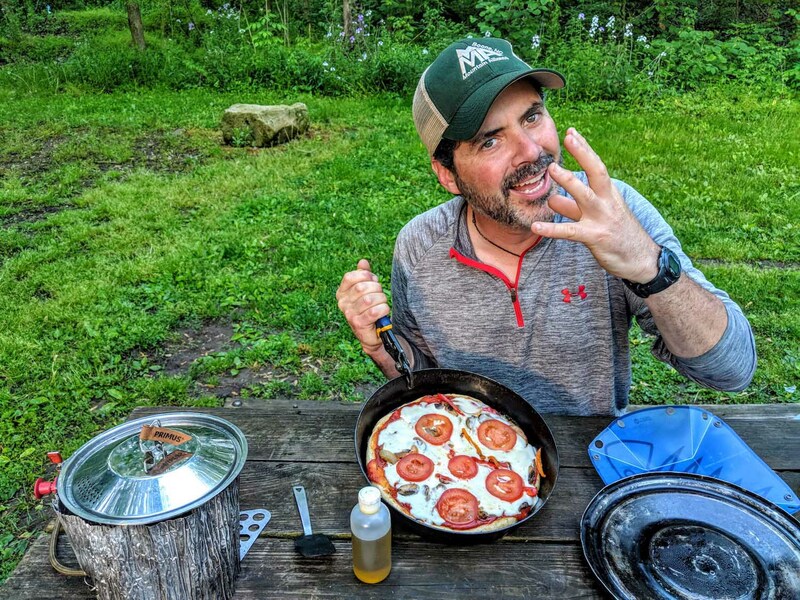 This week, Shari and Hutch share their camping kitchen hacks for the outdoorsy cook. Small and simple tricks have made a big difference in our life on the road. Since moving into our travel trailer five years ago, we’ve learned to improvise and adjust for our smaller living space. When it comes to food, we’ve learned to cook in our camper and at campgrounds, without sacrificing great meals. A camping kitchen can be so much more than a fire and a pot of beans. These tips and tricks are for the gourmet camper who isn’t willing to give up delicious food. Even though our small heater brings our tiny space up to a livable temperature when it’s cold out, we found our pancakes, French toast, and coffee getting cold. These pot coozies help keep our breakfast or side dishes warm while we’re finishing the rest of the meal (like a warming oven). They also save fuel when we’re in the back country; you can bring the water to a boil and then add rice or pasta and let it slowly cook off the heat while you are preparing the rest of the meal. With extra material, we made some to fit our favorite coffee mugs, too. 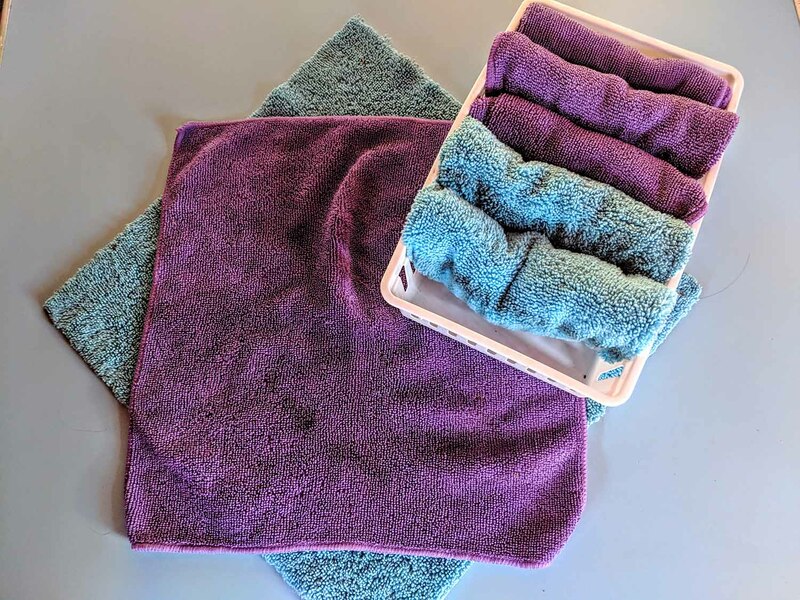 These are homemade out of the material used to keep the sun from heating up your car in the summer and duct tape, so you won’t find them in stores… at least not yet! Small, stacking, silicone bowls are so great for so many things; we use them as ramekins, measuring cups, egg separators, egg poaching dishes, and more. They also double as perfect backcountry camping bowls. Any Target, Walmart or kitchen store carry these bowls. As we roll down the road, things rattle and roll back in the trailer. We would have lost more than one of our favorite ceramic dishes in the last 90K miles without these layers of foam between each plate and bowl. We cut up a roll of drawer/shelf liner so they fit nicely. This keeps us from having to eat off cheap plastic or disposable dishware — better for us and the environment! Any home improvement store will carry this product. This might be our favorite of the many camping kitchen hacks! 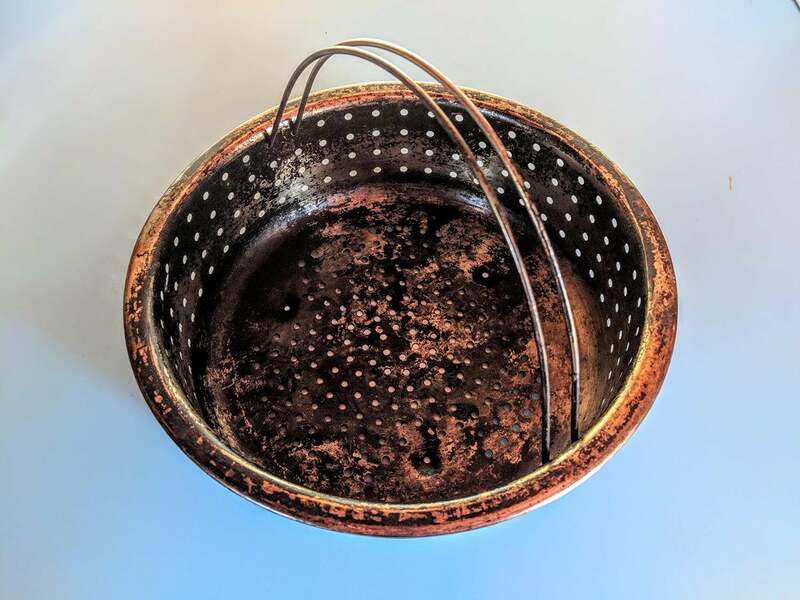 An old steamer basket from our former pasta pot is now a steamer basket, a colander, and a veggie grill basket – 3 uses in one! If you are downsizing to a new life on the road, keep this basket and donate the huge pot. We really missed waffles, but we couldn’t dedicate the space to a traditional Belgian waffle iron for the occasional craving. We found a cast aluminum, non-electric waffle iron in an Amish store and it works great on our gas stove or over a campfire. It makes tasty, crispy, waffles and it doubles as a bed warmer on frosty nights! Many people we meet on the road tell us they cannot give up their electric coffee maker. 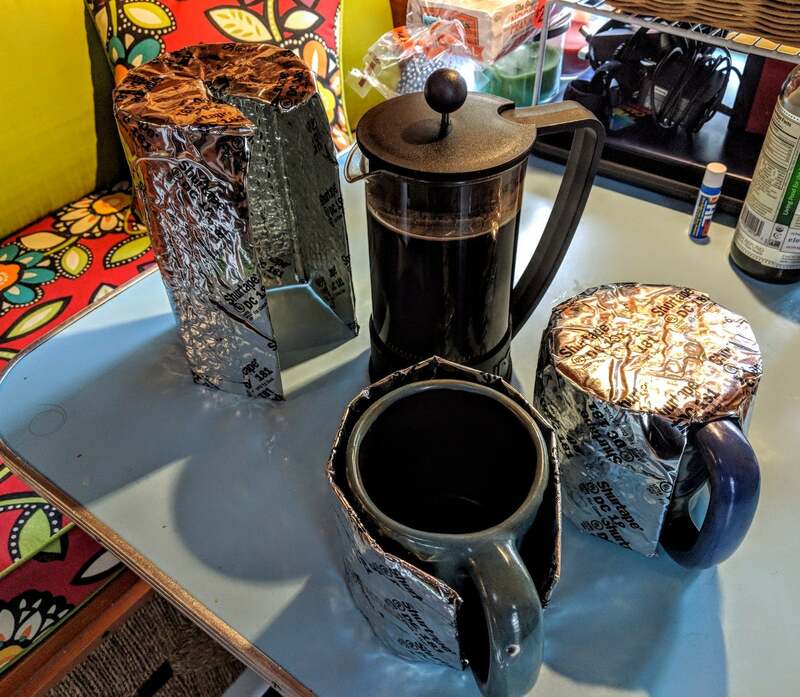 We love our French press because it is easy, low tech, and makes an excellent brew even while boondocking. Boil water, measure coffee, pour water, wait 3 minutes, press, and drink. It’s foolproof and doesn’t require you to fire-up your generator at 6:30am just to make coffee. And we made a coozie for it, which keeps it warm in between refills and helps it from breaking during travel. The French press is available pretty much anywhere electric coffee pots are sold, as well as most coffee shops. This is hands-down the best piece of backcountry cooking gear we ever purchased. It fries and bakes, just like the namesake. We can make pizza, cornbread, brownies, eggs, sauté veggies, and more. We use it on our two-burner stove, our backcountry stove, and on a campfire. You can buy this indispensable pan online: frybake.com. These little stackable containers are just as good for your oregano and basil as they are for rubber bands and paper clips. 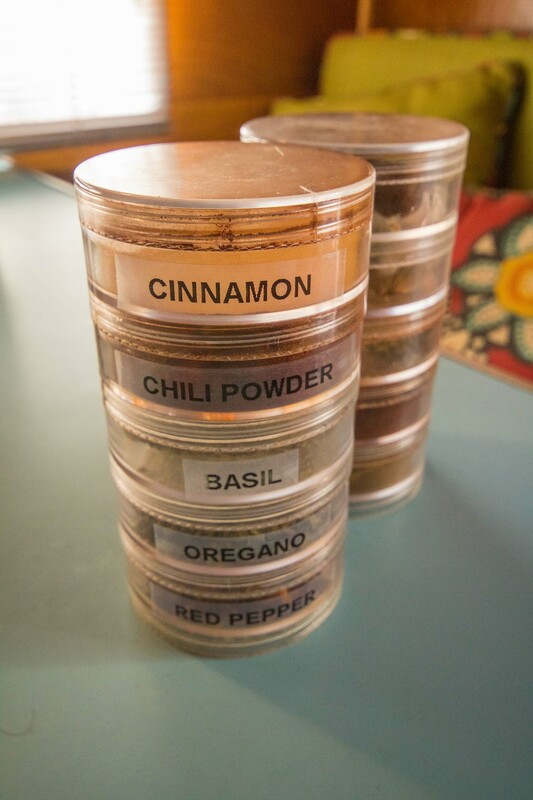 Instead of buying large quantities of spices that take up a ton of shelf space and take forever to use up, buy what you need for a couple of months in a natural food store (bulk spices are less expensive and often tastier!). We bought these containers at Michael’s (in the jewelry section), but they are available at most craft stores. They come in various sizes. We never thought much about paper towels prior to living life on the road. They just need to be nearby and soak things up. But, Viva has a cling-like quality which keeps it from unraveling while we’re traveling down the road. You can find Viva paper towels at pretty much any store that sells paper products. Note: To reduce paper towel usage, we use the towelettes mentioned above and Simple Green to wipe up most spills. We have a small sink, which we rarely use as an actual sink. Mostly it holds our stacking 3 bin dishwashing system. One holds the dishes, the other two are used for washing and rinsing. But, if we are boondocking and using unfiltered water, we use the standard rafting trip protocol: one tub for washing in hot water, the 2nd for rinsing, and the 3rd for a cold water bleach rinse/sanitizer. We can use these bins inside or outside. Bonus…we save a TON of water by using this method rather than a traditional sink. These were purchased at Walmart and they happen to fit inside our sink perfectly. This measuring cup converts from a quarter cup, to a half or whole cup. The spoon is also convertible – the silicone “cups” just flip inside out to go from 1 TBSP to 1 tsp and 1 tsp to ½ tsp. We found both of these items at Target. This container is supposed to go in the fridge, but it holds 5 liters just as well under our sink. It delivers an easy flow of fresh water with the lift of the tap. We didn’t want to have to haul a huge jug just to fill up the kettle or a pot. This container has been crucial to having enough potable water with which to cook and drink when we are not near a drinking water source. We also keep a spare gallon jug around for extra water. Purchased this one at, you guessed it….good ol’ Walmart. When you don’t have a drain of a sewage pipe in your camping kitchen, what do you do with coffee grounds, the liquid in bean cans, toothpaste water, etc.? We re-purposed a deli-sized bulk mustard container with a secure lid for all of our grey water when we are staying in places like Walmart, rest stops, etc. that don’t have good place to dump liquids. When we find a dishwashing sink or toilet at a campground, we dump it down and rinse out the container. You could buy something similar, but our suggestion is to go to your nearest deli and see if they have a bulk-sized mayo, mustard, or salad dressing container you can take off their hands for free. They’re easy to pour without making a mess! Stay tuned for more from Full-Time Campers Shari and Hutch.